A former Christian Brothers teacher has been convicted of sexually assaulting two children in the 1980s. 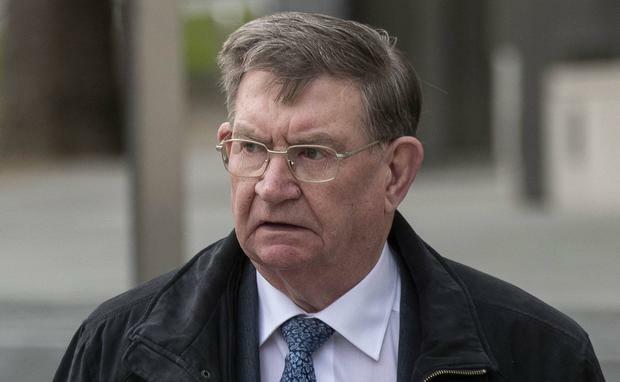 John Gibson (71), of Dun Laoghaire, Dublin, had pleaded not guilty at Dublin Circuit Criminal Court to two charges of indecent assault against a 12-year-old girl at a Christian Brothers school in Co Wexford, between May and September 1983. He had also denied indecent assault of a young boy between May and September 1985, when the complainant was also 12 years old. During a five-day trial, the two victims testified that Gibson had molested them while washing them after they had carried out some manual work around the school. Yesterday, the jury returned majority guilty verdicts on all three charges after spending just over four hours deliberating. Judge Elma Sheahan thanked the jurors for their care and attention to the case. She remanded Gibson on continuing bail until his sentence hearing on March 19. She further ordered victim impact reports to be prepared for that date. The female victim, who is now aged in her 40s, told Diana Stuart BL, prosecuting, that during the summer holidays in 1983, Gibson had asked her to paint a wall in the Wexford school. He told her to change into clothes he gave her and, she said, "he specifically told me to take my underwear off". After the painting was done, the defendant told her she would have to clean up. She said he returned with a basin of water, face cloth and soap and told her to get undressed. He then began washing her around her private parts. The male complainant told the trial that in the summer of 1985 he agreed to help Gibson "grease the goalposts" in the school sports field. Grease was sometimes applied to the posts as a measure to stop children climbing them. After carrying out the task, the accused told the complainant to go into a shower area and strip off, the man testified. He said Gibson came into the shower room with a bottle of washing up liquid, which he used to wash the boy around his private parts. The witness told the trial he closed his eyes and hoped it would end. He said he told nobody about the incident until he told his wife in the 1990s. A brother of the first complainant testified that Gibson had a reputation for being a violent teacher, while the second complainant gave evidence that, as a pupil, he had received a few "bad beatings" and "boxes" from the teacher. In interviews with gardai, Gibson repeatedly denied the offending and said he did not remember either of the complainants. Judge Sheahan ordered Gibson to sign on at Dun Laoghaire Garda Station once a week, surrender his passport and notify authorities of any change in his address.